DROP 100 LOSSES FOR A GOOD CAUSE! Enter Stablecade this year to have 20 or even 100 losses removed from your wrestler's record! All the money we raise will go to help IWA manager Jim Ripka recover from his recent stroke. For a sign-up form, click HERE, or go to our League Champions page. To contribute directly to the fund for Jim's family, click HERE. Let's show Jim that being an IWA manager means always having someone in your corner! Celebrities. Sometimes, we love them. We celebrate after our favorite athlete wins the game. We brag after our favorite singer finally gets her first number one song. We search the Internet, looking for the latest on our favorite actor's personal life. Sometimes, we dislike them. When our least favorite athlete chokes when it matters most, costing his team the game, we smile. When our least favorite singer's song doesn't even chart, we celebrate. When our least favorite actor goes to jail, we laugh. It is likely to be in the Steel Federation. It will hopefully debut in one cycle, roughly four weeks from now. All wrestlers must be either celebrities, or a reference to a celebrity. Their friends, their fans, their band-mates, their family, their songs, their movies, their highlights or lowlights. By definition, a celebrity is someone who is famous. This includes actors, singers, athletes, politicians, reality stars, models, authors, and TV personalities. Plenty of possibilities. This league will have no limits. 1-25, run whatever you want. The commissioner report will include a rankings page, updated regularly. All the superstars in the league will be celebrities. This includes the jobbers, and announcers. 5 free matches will be given to the manager of the league champion. 5 more will be given out for every IWA Report appearance, big or small. If this league interests you, email Matt Yunick at mattyunick, followed by the @ symbol, and then gmail.com. We already have several managers who have expressed great interest in joining; we only need several more. With your assistance, Matt looks forward to making this a fun league for all. "The Rumble is a couple tours away, and already the prize is over $2,000,000 in I-cash! Will the prize reach over three million by the time of the contest? In addition, we welcomed quite a few debuting wrestlers last cycle, who will undoubtedly be looking to make an impact. With several major feuds ready to explode, what will the UNL's 30th cycle bring?" For the latest issue, right click HERE and choose "Save Target As..." (you will be downloading a PDF file with a size of 2.5MB). "Welcome back to Refresh Tuesday! The Johnny B Cup kicked off in March, and now we are down to 64 wrestlers, while the Marano tournament will see its own first round matches this cycle. With our latest IWAR title series complete, who retained their championships, and who will be the next challengers? An unprecedented three pay-per-views took place last cycle, so make sure to check the bulletins for the results and write-ups! As always, each league also recaps some of their latest action. Finally, we have a teaser for the next upcoming IWAR events, which are sure to be exciting as we approach the warm months of summer! Our continued thanks to all the managers who contribute to making the IWAR one of the best places to play the game! We couldn't do it without all of you." For the latest issue, right click HERE and choose "Save Target As..." (you will be downloading a PDF file with a size of 1.9MB). For the latest issue, right click HERE and choose "Save Target As..." (you will be downloading a PDF file with a size of 2.3MB). For the latest issue, right click HERE and choose "Save Target As..." (you will be downloading a PDF file with a size of 4.9MB). "The LNL has reached its 50th cycle. I would like to thank all the managers who helped get the league to where it is today. Here's to the next 50 terrifyingly awesome cycles!" For the latest issue, right click HERE and choose "Save Target As..." (you will be downloading a PDF file with a size of 2.4MB). FIRST RULE OF THE WWL: THERE IS NO WWL! What could "The Gold Standard" Commissioner Melvin Mayhem possibly mean by this? Is the WWL over just as quickly as it began? Is the league closing this cycle? Is the IWA's game-changing commissioner at it again? There's only one way to find out the answer! The Wicked Warz League is officially off the radar and truly in a world of its own. Information will only be granted to those worthy of admission. Break free, break the rules, and BREAK THE WALLS DOWN! Contact Commissioner Mayhem today, and get ready for an experience you will not find anywhere else in the IWA. "Hello, IWA managers! My name is Will Wizdom, and I am the proud commissioner of the AWL. CCL mastermind Terrence Bischoff, other Steel Federation commissioners, and I have formed the Steel Interfed Association. Our organization recognizes the IWA Steel Interfed World Heavyweight Champion, an NWA-style traveling champion who defends the title in each league of the Association on a rotating schedule. "Would you like a shot at the World Champ's title? Join the Steel leagues in the Association: the AWL, CCL, IIL, LSL, MUL, OSL, and our nWo-style STW (which involves both the AWL and CCL)! "Have you always wanted to be a commissioner? Join one of the other Steel Fed. leagues, and contact me (my info is in the AWL bulletin) to join the Steel Interfed Association!" For the latest issue, right click HERE and choose "Save Target As..." (you will be downloading a PDF file with a size of 2.9MB). Learning the ropes in a game where those ropes are imaginary can be confusing, but this unofficial How to Win in the IWA video is here to help. 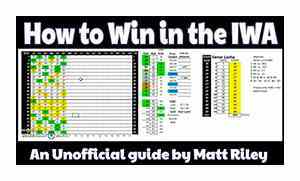 Join IWAR and BRL Commissioner Matt Riley as he walks you through the fundamentals of the game to help you get a better grasp of the IWA. "The Unofficial History of the IWA, as brought to you by the IWA Ringside Magazine. 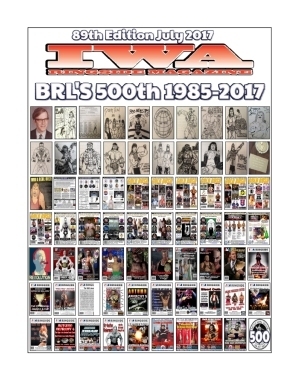 This special edition is loaded with pictures, stories, and nostalgia from over 30 years of the IWA." For this issue, right click HERE and choose "Save Target As..." (you will be downloading a PDF file with a size of 14.1MB). The current bulletins from all our leagues are now available on our League Champions page. These PDF files are updated the same day the federation results are posted and include everything the snail mailed versions have, with the added bonus that some feature trash talk pages in full color. Match results are also available in HTML format from that same page, for those who want a searchable option. If you want us to continue providing results this way, contact Kimberly and tell her you'd like to "go green." We'll stop sending you printed bulletins, which will help keep our prices low, and you'll get the warm, fuzzy feeling that comes from knowing you just helped save the planet. Everyone wins! If you need another match form, right click HERE and choose "Save Target As..." (you will be downloading a file with a size of 63KB). For another Stablecade contest form, right click HERE and choose "Save Target As..." (you will be downloading a file with a size of 34KB). These are PDF files, so Windows users will need to install the free Adobe Reader to print them out. Click HERE to open the download page in a new browser window. Keep a copy of every email you send us. If you do not receive a reply within 48 hours (not counting Saturdays, Sundays, and holidays), resend your message. Kimberly replies to all legitimate email. Also, make sure to email any matches, strategy changes, etc. at least 24 (and preferably more than 48) hours before your league will be processed. Your wrestler's number of stars, current point flow, and previous strategy total are now used as additional tie-breakers in our league rankings system. The new progression is as follows: activity status (active or inactive -- see next paragraph), having at least one win, number of wins over losses, total number of wins, number of stars, amount of imaginary money, number of ties, point flow, and strategy total from the previous cycle. Also, each wrestler must initiate a one-on-one match to be considered active. Tag-team matches, six-man matches, and battle royal entries do not count toward activity. Inactive wrestlers cannot compete for major titles, so if you'd like to see your grappler's name in the IWA Report, don't forget to have him sign at least one singles match! From now on, managers may not create new wrestlers or transfer existing wrestlers into rookie leagues without permission from both the league commissioner and IWA Management. This protection does not expire after a certain number of cycles: it ends when it is agreed that managers in the league are ready to compete against more experienced players. We hope this change will provide those who are new to the game with a chance to hone their skills on a more even playing field. The Special Leagues page contains a list of our rookie leagues. Our policy against changing stable initials after a league has been processed, but before The IWA Report has been published, failed to address the special nature of the World Wrestling League. Since this league does not allow stable initials, managers are prevented from gaining recognition for their group on an IWA-wide basis should they win a major title. Attaching stable initials in The Report alone should have zero impact on in-league angles and storylines, since the WWL doesn't even use them (and by "them" we mean stable initials; the WWL certainly uses angles and storylines!). Because we are also able to afford our snail mail players the same option, we see no reason to prohibit managers from having Report-only initials in this league. Effective immediately, wrestlers may only change their names and/or stable initials at the time their league is processed. As usual, Kimberly has been too nice in honoring requests, and we feel the situation is getting out of hand. Allowing these changes to occur between bulletin mailings can create confusion, and leave managers who choose to play via snail mail feeling "out of the loop" or like less-valued members of our wrestling family. We want to use the Internet to provide conveniences for all who play our game, but that must be balanced with keeping the emphasis on the league bulletins -- where the action is! When wrestlers are permitted to change these attributes between bulletin mailings, it makes online activity just as important as league activity; it's as if time doesn't "pause" between bulletins #34 and #35 like it should, but instead continues on in some arena that exists only on the Internet. That's obviously not fair to our snail mail players. Add it to your Favorites so you can return easily.